This is the best blanket, period. I know it doesn’t look like it’s that different from the thousands of others on offer for babies and little kids, but it is. It’s single-ply jersey, not flannel or fleece like many baby blankets. This means it’s very soft and stays soft and is just warm enough for summer nights and snuggling. 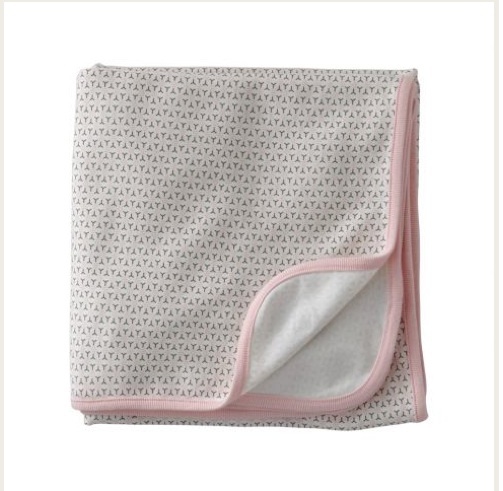 It’s size, stretch and weight also make it excellent for swaddling. It’s big. At 40″x40″, it’s considerably bigger than many baby blankets which means Baby can use it in bed when she’s a toddler, as our daughter does. This won’t seem like a big deal right away to Mom, but it will be when little Violet turns one and can’t use any of the 1000 blankets she received at her shower. That’s it. That’s all I’m looking for in a blanket and Tea Collection delivers. Perfect for a second baby shower or a gift to bring to the hospital.